A federal judge in Manhattan has dismissed New York City’s nuisance lawsuit seeking to hold five major oil companies liable for the effects of climate change caused by greenhouse gases. U.S. District Judge John Keenan said climate change “is a fact of life” but it’s a problem that must be addressed by the political branches of government rather than the federal courts. Courthouse News Service and the New York Times have stories. 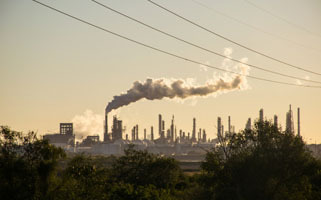 Keenan’s ruling follows a San Francisco federal judge’s decision last month to toss climate change lawsuits filed against oil companies by two cities in California’s Bay Area. Both judges cited the 2011 U.S. Supreme Court decision American Electric Power v. Connecticut, which held the Clean Air Act displaced federal common law claims relating to greenhouse gas emissions. A spokesman for New York Mayor Bill de Blasio told Courthouse News Service that the city intends to appeal.